The real problem is that anti-Semitism has become an integral part of Palestinian and Arab nationalism, imported from the west. 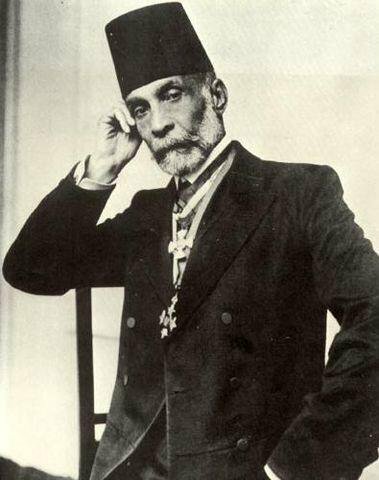 Musa Kazim al-Husayni (1850-1934). Reproduced from http://www.passia.org with permission (Mahmoud Abu Rumieleh, Webmaster). Wikicommons. Some rights reserved.I am a Jewish, Israeli Zionist. I live on a farm in the Negev region of Israel. I have a master's degree in politial science and international relations and am a retired English teacher in several Israeli high schools including two years at a Bedouin high school. I have been and remain a farmer for the past 42 years. I have been following the interchange between Mary Davis and Jonathan Rosenhead. Their argument seems to have grown out of the charges of anti-Semitism leveled at the British Labor Party. However the discussion has expanded into an evaluation of Zionism and the conflict between Israel and the Palestinians. In both writers a serious flaw has appeared in their writings which, in my opinion, should call into question any conclusions they may have drawn and more importantly, leads to a certain intellectual error about the source of anti-Semitism in the British Labor Party and elsewhere. This flaw is that both writers in their own way have left the Palestinians and Palestinian nationalism out of the discussion. This has led to some rather odd developments in the discussion. This rejection of Jewish right to nationhood as well as statehood did not originate in the PLO charter but was one of the Arab nationalist claims against Zionism from very early in the dispute, long before there was a State of Israel. However this question of right to statehood was raised only in the latter stages of the Davis-Rosenhead interchanges. Going back to the beginnings of the discussion the question asked is how does one differentiate between anti-Semitism and anti-Zionism and/or criticism of Israeli policy. I would assert that this is not the real problem faced by the British Labour party, or for that matter any party or group which seeks to support the Palestinian cause. The real problem is that anti-Semitism has become an integral part of Palestinian and Arab nationalism. Therefore the real question becomes how does one support the Palestinian cause without being infected with Palestinian anti-Semitism. Modern anti-Semitism did not originate in the Middle East. Much like nationalism, it was imported from the west and very often by the same people. One of the earliest examples of modern anti-Semitism in the Middle East was the Damascus Blood Libel in 1840. The Damascus affair came about when a Christian monk and his servant disappeared and thirteen Jewish notables were arrested and charged with using the monk’s blood for ritual purposes. The origins of the charge were some of the local Christian clergy and the French Consul resident in Damascus. The affair ended when nine of the Jews were released, four having died under torture, and a firman was issued by the Sultan which attested to the falsehood of the blood libel charge. This was several decades before Herzl founded the Zionist movement and two decades before modern Jewish settlement by proto-Zionist movements. It bears repeating that the source of the calumny was not the Muslim Ulema or the Ottoman authorities but rather Christian clergy in combination with the French Consul. Despite the alien nature of anti-Semitism, anti-Jewish behavior among Muslims became more evident. Pogroms against Jews were reported in Aleppo (1850, 1875), Damascus (1840, 1848, 1890), Beirut (1862, 1874), Dayr al-Qamar (1847), Jaffa (1876), Jerusalem (1847, 1870 and 1895), Cairo (1844, 1890, 1901–02), Mansura (1877), Alexandria (1870, 1882, 1901–07), Port Said (1903, 1908), and Damanhur (1871, 1873, 1877, 1891). Anti-Semitism became food for thought for Arab nationalists, many of whom were Christian, and began to show up sporadically in Arab nationalist thought and propaganda. One of the earliest appearances of anti-Semitism in proto-Palestinian nationalism appeared in a presentation in 1921 by Musa Kazim al-Husayni, President of the Executive Committee of the Arab Palestine Congress to the British Secretary of State for the Colonies, Winston Churchill. The Jews “… in Germany are Germans, in France Frenchmen and in England Englishmen”. …”Jews have been amongst the most active advocates of destruction in many lands, especially where their influential positions have enabled them to do more harm. It is well known that the disintegration of Russia was wholly or in great part brought about by the Jews, and a large portion of the defeat of Germany and Austria must also be put at their door. When the star of the Central Powers was in the ascendant Jews flattered them, but the moment the scale turned in favor of the Allies Jews withdrew their support from Germany, opened their coffers to the Allies, and received in turn that most uncommon promise. “For a long time, the enemies have been planning, skillfully and with precision, for the achievement of what they have attained. They took into consideration the causes affecting the current of events. They strived to amass great and substantive material wealth which they devoted to the realization of their dream. With their money, they took control of the world media, news agencies, the press, publishing houses, broadcasting stations, and others. With their money they stirred revolutions in various parts of the world with the purpose of achieving their interests and reaping the fruit therein. They were behind the French Revolution, the Communist revolution and most of the revolutions we heard and hear about, here and there. With their money they formed secret societies, such as Freemasons, Rotary Clubs, the Lions and others in different parts of the world for the purpose of sabotaging societies and achieving Zionist interests. With their money they were able to control imperialistic countries and instigate them to colonize many countries in order to enable them to exploit their resources and spread corruption there. I would draw the reader’s attention to a commonality between the anti-Semitism of the 1840 Damascus Blood Libel, the 1921 submission to Churchill and the Hamas Charter written individually over the course more than a century. Each originated from European sources alien to traditional Islam but not to traditional Christianity. Nevertheless, anti-Semitism has become a part of Palestinian and Arab nationalism whether Islamic or nonsectarian. Rather than document that fact with numerous quotations I direct the reader to Chapter eight “The War Against the Jews” in Bernard Lewis “Semites and Anti-Semites” (Phoenix, London, 1997) pp192-235. There one will find abundant quotations and citations which should illustrate the point to the reader in quest of objectivity. The fact that the anti-Semitism in Palestinian nationalism has been missed is partially explained by the practice of proponents of the Palestinian cause who leave the Palestinians out of the discussion. This seems to be the case with Davis and Rosenhead in their discussions thus far. I suspect that there are a range of reasons for absence, from a propaganda ploy to an assumption that Palestinian nationalism is totally consistent with their own ideological beliefs, so rather than fully explore that nationalist ideology they just fill in the blanks with their own beliefs. No matter what the cause, the end result is that anti-Semitic tropes employed by various Palestinian groups find their way into the advocacy of their supporters. I certainly agree that criticism of the policies and actions of the State of Israel should not automatically be considered examples of anti-Semitism. In my opinion it remains to be seen whether or not the adoption of the Palestinian narrative by the British Labour party and others can be accomplished without also adopting its anti-Semitic elements. I suspect that this can be done, but not without first coming to recognize that some elements of the Palestinian narrative are indeed anti-Semitic and must be condemned and rejected, while other elements may warrant support.